No doubt by now you’ve heard about the college admissions scandal, resulting in notable actors Felicity Huffman and Lori Loughlin charged with fraud, among more than 30 other wealthy parents. The story broke over the week of March 11, with more details emerging each day. 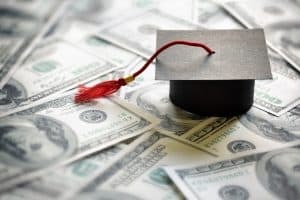 This scam – the largest ever prosecuted in United States history, by the way – was a scheme to get students admitted to various colleges and universities around the country. It centered around William “Rick” Singer, who operated a counseling and admissions company, as well as a non-profit called The Key World Foundation. Singer calls this, uh, creative way of bribing your kid’s way into school a “side door.” The front door, of course, is getting in the correct, old-fashioned way. The back door is buying your way in, by being wealthy enough to buy a building or endowment. This side door is for those who aren’t wealthy or “worthy” enough to use the back door – and Singer guaranteed it worked every time. Aunt Becky shelled out half a mil. Yep, Lori Loughlin paid out a total of $500,000 to have both daughters designated as recruits for the USC crew team, even though they’d never been on crew in their lives. Her daughter Olivia Jade quickly capitalized on college by becoming an Instagram influencer and expressing her disdain for class. As of this writing, both young women have left USC. People Photoshopped kids’ heads onto other kids’ bodies. Seriously. You can’t be a fake athlete without an athlete’s body to prove it, I guess? But yes, Singer’s associates sometimes pasted clients’ kids’ heads onto the bodies of completely different athletes to make their phony profiles look more realistic. Which is why one 5’5” kid was suddenly six feet tall on his brand-new basketball profile. Parents had kids submit their handwriting. According to court documents, at least one parent had their child submit Singer a handwriting sample, telling the student it was so testers could see their writing style. In reality it was so the person who was going to take the test for the student could forge their name. Most kids didn’t even know. This might be the worst part, honestly. The majority of the kids didn’t even know their parents were pulling all these strings and paying out all this cash. Well, we’re sort of sure Lori Loughlin’s kids knew, since they willingly posed in front of rowing machines. The Feds found out via an unrelated case. Feeling the heat during an unrelated federal investigation, a Boston executive tipped off the FBI about the scam, hoping for mercy. This opened up the biggest college admissions scandal in history. It remains to be seen if the man will get the leniency he was looking for when it comes to his charges. Sometimes we make the wrong or uninformed decisions. Or sometimes people take advantage of our goodwill. If you need guidance and defense, talk to Drew Cochran, Attorney at Law. Call 410-777-8103 or complete my contact form to schedule a meeting in my Annapolis office.